There are four people in the band called the Beatles. 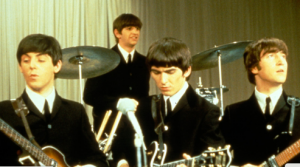 John and George are playing the guitar. Paul is playing the base, and Ringo drums. They are the BESTEST band ever in the history!